The answer to this question is as young as two years old. Which astonished us at Anatomised. But let us tell you how we came to ask the question in the first place. Diageo, a client of ICP, a production agency, was helping a small charity called Sickle Cell Sufferers and Young Stroke Survivors (SCYSS). Anatomised were asked by ICP to create a digital poster for sites that had been donated to Diageo by Prime Site. Two of these sites were at the Westfield shopping centres, at both Stratford and Shepherd’s Bush. They were moving posters, giving us a ten second slot to fill. But before we did anything, we wanted to meet the clients from SCYSS to learn about their charity and what it did. The two women who turned up to brief us were impressive, to say the least. Carol Nwosa and Maureen Gwam appear to be quite different but possess complementary qualities. Carol is passionate about helping sufferers from Sickle Cell Disease, to a large extent because the disease blights her son. As founder of the charity her passion seems to be its driving force. Maureen, on the other hand, is perhaps more cerebral, with a keen intellect that displays an analytical flair. In simple terms, that makes Carol the charity’s heart and Maureen, the charity’s head. But that’s just our opinion and we could be wrong. What isn’t in doubt is that they make a charismatic team. Their briefing was moving and informative. None of us at Anatomised knew much about the disease, probably because none of us are members of the Afro-Caribbean community, the section of our population it most affects. 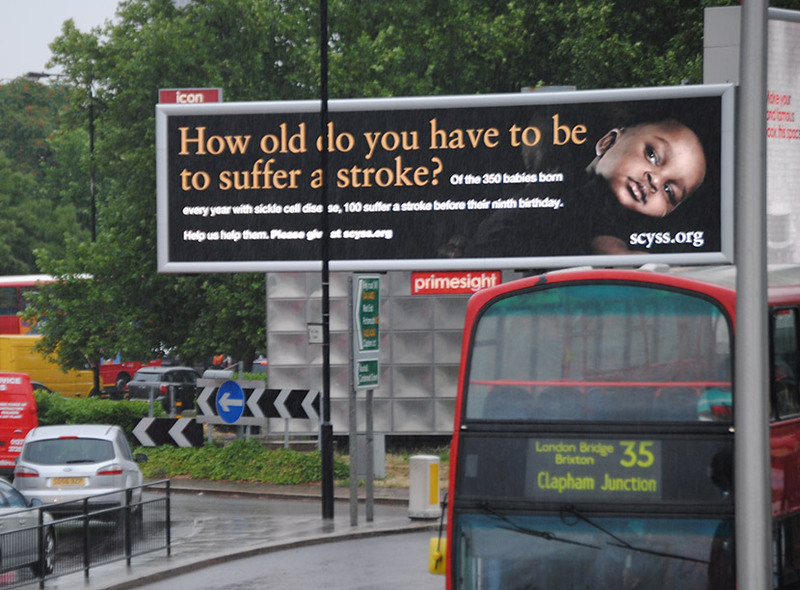 But we soon learnt that 300 babies are born every year in the UK with Sickle Cell Disease. Of these, 100 go on to suffer a stroke before their ninth birthday. This fact stuck in our minds. When we set about creating the poster, we kept coming back to the stroke before ninth birthday thought. Our headline, which is also the headline of this blog, was more or less the first thing we thought of – except we kept expressing it as a statement. Somehow, that didn’t work. It lacked something. Then, we tried expressing the thought as a question. Bingo! We were suddenly in business. But we still needed a visual. What could we use, remembering that it had to move and keep people’s attention for 10 seconds? We had already decided that if the poster was static, we’d show a young black kid as the visual, as a counterpoint to the headline. But, for the moving version, we decided to start off with an elderly black man and morph through the ages finishing up with the young kid. Then, almost immediately, we thought of another way of doing it: start off with the elderly man, but then rotate the camera to reveal the young kid on his shoulder. We decided the latter was simpler, and therefore better. First, we had to show Carol and Maureen what we’d done so a meeting was arranged. Carol brought along her son, Daniel, who’s already suffered several strokes as a result of Sickle Cell Disease. They, too, loved the poster. Maureen liked it so much she seemed to never stop thanking us. Carol volunteered her father to play the part of the elderly man. In a fun afternoon we shot the footage we needed at a small studio in Warren Street in London’s West End. We edited the finished result the following day. As well as the Westfield sites, Diageo had donated a number of Prime Sites elsewhere in London. One of these was smack bang outside the charity’s office at Elephant and Castle. Carol and Maureen got so excited when this one appeared that they emailed jpegs of it to us. At Anatomised we were equally excited to see the poster running. And we were pleased to give our time and effort, especially as Carol and Maureen work for the charity for free. If anybody deserves help, they do.